How Did Americans Support U.S. Troops During World War I? Here Are 5 Ways. One hundred years ago on November 11, 1918, World War I finally came to an end. It was one of the most devastating wars in human history. Worldwide, an estimated 40 million people were killed or wounded, including more than 300,000 American service members. Far from the front lines, American citizens came together to support the war effort and the troops fighting “over there.” Although the USO was not founded until 1941, the Great War built the foundation for the USO and its future mission of supporting service members and their families. So, without the USO, how did everyday Americans support service members in World War I? Here are five ways civilians stepped up to show their gratitude and appreciation for our military. For service members and civilians alike, boosting morale was crucial throughout World War I, and much of that was done through humor. From decorative posters, to uplifting songs, to amusing cartoons, American society came together to bring lightheartedness and encouragement to soldiers serving abroad. 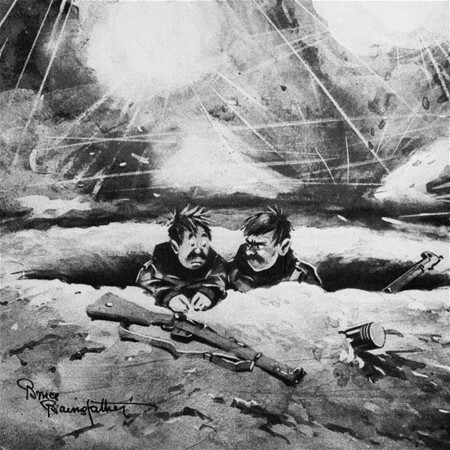 Comic drawings and cartoons, such as Bruce Bairnsfather’s “Old Bill,” were especially popular among the troops. Bairnsfather’s work was so popular that in the following years of World War II, he was employed as the official cartoonist to the American forces in Europe, and contributed to Stars and Stripes and Yank, the famous magazine published by the U.S. military during World War II. Civilians donated to charities such as the Young Men’s Christian Association (YMCA) or the Salvation Army, both of which would later come together to form the USO during World War II, along with four other organizations. Donations from civilians went towards YMCA camps near the front lines, where they provided troops with a canteen, concert hall, library, game room and a quiet area – much like the USO centers of today. The American Library Association raised funds to supply soldiers with books and magazines to read, and civilians purchased war bonds and postage stamps to help fund resources for the military, fueling a shared, fighting spirit across the country. When far from home, troops craved a reminder of their loved ones. That is why organizations such as the National Jewish Welfare Board – which would later become incorporated into the USO – led letter-writing campaigns throughout the war to deliver mail to service members overseas. Everyday Americans would gather in their homes, churches and community centers to write letters of encouragement to service members fighting overseas. Share your message of support with our troops today. It wasn’t just adults who contributed to the war effort – children also got involved. As the war raged through Europe, farming came to a halt, leaving many people without any food. 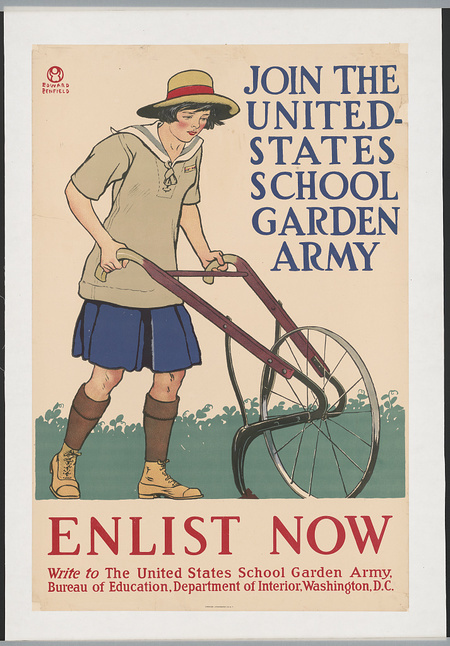 Across the country, government-led programs encouraged children to turn backyards, empty lots any other unused spaces into gardens, where they could grow food to help feed troops overseas. These “Victory Gardens” were mostly planted and tended to by children in the United States School Garden Army, which built more than 5 million gardens and produced over $1.2 billion in fruits, vegetables and grains by the end of the war. Much like the actors, comedians, athletes and artists who dedicate their free time and talents to supporting the military on USO entertainment tours, many celebrities during World War I also supported the troops. Film star Mary Pickford, known as “America’s Sweetheart,” used her fame to encourage others to support the war effort. James Reese Europe – a leading figure in the African-American jazz community – fought as an Army lieutenant and brought jazz to American, French and British military audiences alike with his renowned 369th Infantry Regiment band (also known as the “Harlem Hellfighters”). Famously, George M. Cohan’s patriotic song, “Over There,” inspired many to enlist in the Army and boosted morale when it was performed along the front lines. So how do we support service members today? No matter where are troops serve – whether it’s downrange on an isolated forward operating base or inside a busy international airport – the USO is there to support our military and their families when they need us most.